Bulkhead fitting with 90° barb and screen. Flange side is 1/2" Slip Socket, nut (or back) side is 1/2" barb. 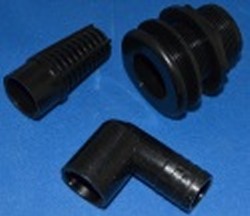 Works with holes from 1-1/8" (1.125") to 1-1/4" (1.25") hole. Comes with glue (or press in) screen and 1/2" barb 90.